Are You an Ideal Candidate for Invisalign in Copperas Cove? In the past, getting a straighter smile was an arduous process. The metal brackets, bands, and wires that came with traditional braces took a lot of getting used to. Patients would have to change their brushing habits and their diet just to accommodate them. They would take an average of two years of wear before treatment could be complete. All these requirements caused many patients to disregard orthodontic treatment altogether. Since then, they’ve had to deal with their poor bites. 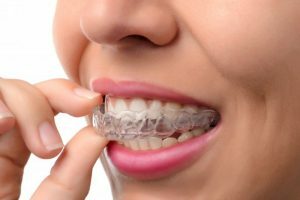 Thanks to Invisalign in Copperas Cove, candidates can reap all the benefits of straight teeth without being forced to use metal braces. Whether you’re a teenager pursuing orthodontic treatment for the first time, or an adult who had braces previously but are now experiencing a relapse as a result of not wearing your retainer, Invisalign can work for you! Since it’s conception in the late 90s, clear aligners from Invisalign have become incredibly advanced and innovative at realigning teeth. Whether your case is simple or complex, there’s a good chance it can fix your poor bite and crooked smile very effectively. Plus, you’ll have a consultation with your dentist beforehand to ensure it’s the best treatment option for you. Invisalign has helped over 5 million people transform their smile. It’s also the oldest clear aligner system in the world, so you can feel confident that it will solve your bite problems and misalignment. During your consultation, your dentist can actually map out your entire treatment from beginning to end, so if any issues should arise, he can make adjustments later. Do I Have to Change My Habits? Since clear aligners are removable, you don’t have to make any changes to your diet or your brushing habits. No more accommodating for stubborn metal brackets and wires; clear aligners make orthodontic treatment easy without sacrificing effectiveness! The only habits you’ll need to keep when undergoing Invisalign is regularly rinsing and sanitizing your clear aligners, which is very easy to incorporate into your daily oral care. Will People Notice that I’m Undergoing Treatment? The aligners are transparent, so as long as you take proper care of them and don’t expose them to food, drinks (excluding plain water), chewing gum, or tobacco while in use, they’ll maintain their transparent appearance. No one will even notice that you’re undergoing treatment, which is ideal if you don’t want to make dramatic changes to your appearance as an adult. Typically, treatment takes anywhere from 8 to 18 months to complete. For effective results, your dentist recommends you wear your aligners for at least 20 to 22 hours a day. Make sure you always have your next pair ready to use in case your current ones get lost or damaged in any way. This will prevent any interruptions in your treatment. Orthodontics is easy thanks to Invisalign in Copperas Cove! Schedule a consultation with your dentist today to learn your eligibility! Dr. Daniel Caraveo earned his Doctor of Dental Surgery degree from the Baylor College of Dentistry. His practice was given the title of “Preferred Provider” for Invisalign in 2017, so you can expect great results and expertise during and after treatment. To learn more about his practice, contact him at (254) 547-4866 or visit his website. Comments Off on Are You an Ideal Candidate for Invisalign in Copperas Cove?